If you love succulent and juicy chicken, then this homemade poultry seasoning recipe is for you. Perfectly seasoned chicken that you can personalize yourself. 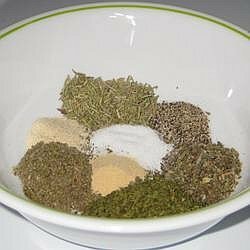 Offering many homemade spice blends and more below. Mix well and store in a airtight covered container. Makes 4 teaspoons. If you have the ingredients on hand, you can make a large batch and keep it in a tightly sealed container. You can also package this seasoning in smaller jars and give as gifts. This is another one of my money-saving tips. Mix the chicken, poultry seasoning, garlic powder, onion powder, pepper and lemon juice together; toss to mix. Set aside for 10 minutes to marinate. Add the remaining ingredients and mix well. Chill for at least 4 hours before serving.